Experts Exchange > Articles > Why is my Office 365 signature not working? We say this many times, but it is worth pointing out that the disclaimer function in Office 365 is actually meant for plain-text messages, not email signatures. Office 365 is not designed to provide native email signature management, so it’s quite common to find an Office 365 signature not working the way you want it to, especially if HTML is involved. This article covers the most common complaints that organizations have when it comes to their Office 365 signatures not working correctly and what the probable causes are. The Office 365 disclaimer function doesn’t let you embed images like logos, social media or banners as it cannot recognize them as separate elements. This is why you’ll find your Office 365 signature not working correctly and displaying images in a way you didn’t intend. 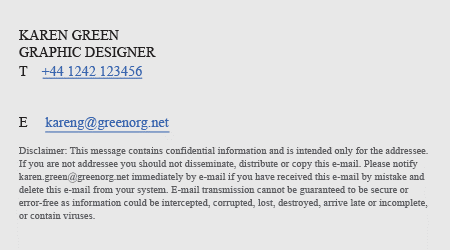 So, if you try to copy and paste an image into your signature, a recipient is likely to see a blank square with a red “X” in it or they will find a separate attachment has been added to the email. To solve this problem, you need to host all email signature images online. You can use your a web server to do this or a free hosting site like Imgur or TinyPic. Once your images are hosted, you’ll be given a URL such as https://a8b03ffbc00ed4da54a1-0c6684360696717b63d89dbc0edb802c.ssl.cf1.rackcdn.com/exclaimer-logo.svg, which you then able copy into the HTML code of your signature. Be aware though that, by default, many email clients, like Outlook, will automatically block any externally hosted images for security reasons. Your recipients will have to click a ‘Download Images’ button before your imagery can be displayed, which is often a nuisance. There are more varieties of email clients than web browsers and the differences between the ways they interpret HTML are more extreme. Also, in this age of tablets and smartphones, you can’t know what device your email is being read on. Remember you aren’t going to be able to embed images into your signature so you have to decide how these are going to appear to recipients. You could include a web-hosted link to your logo, as mentioned previously, but some email clients don’t automatically display these unless the recipient specifically requests it. Is anyone really going to be curious enough about your logo to download it specifically? The other option is to add your logo image as a simple attachment, but do you really want all your emails to look like they have an attachment? How is your IT administrator going to feel about all those extra bytes flying around the network? Each time a message is replied to, the sender’s email software takes the whole mail apart and rebuilds it into a new HTML structure. Your email may look great when it’s received, but by the time it’s been replied to a few times, it might look like the result of an explosion in a brand element factory. When you use an Office 365 Transport Rule, signatures will get attached to the bottom of an email chain automatically. Office 365 cannot recognize if the signature text already exists within a conversation, so will keep adding it to the latest email reply or forward. It also can’t ascertain where the signature should appear in the message, which would obviously be directly under the appropriate reply. So, if you send five replies to a recipient, five signatures will stack up at the bottom of the conversation. The only way around this is to set up an exception to your Transport Rule so that the signature is not appended to every message. This means you won’t get any reply signatures and your original email signature will still just end up at the bottom of the conversation. Either way, you’re not going to be able to get round this if you just use Office 365 Transport Rules. You will no doubt be using your Office 365 Directory or Azure AD to populate every user’s signature. However, it’s important to note that not all users may have the same contact details. Some may have mobile phone numbers while others don’t. The fax number might not be used by everyone. Some users might not have an internal extension number. The list goes on, but it means that certain contact details may end up blank in some signatures. You only have to do a quick search online to see that this is a common problem that affects many businesses, especially now that so many users work away from their main offices. The main issue here is that many mobile devices send emails in a plain-text format, meaning that only plain-text signatures will be included. Like with email clients, HTML behaves very differently in something like iOS when compared to HTML on a website. This usually means that all HTML code gets stripped away, so a recipient will not see all of the great imagery you’ve created. You could ask your users to create their mobile signature themselves (this article shows you how to create an HTML iPhone email signature), but the likelihood is that you won’t be able to manage this effectively. There is unfortunately no way around this. Signatures are added after an email is sent, almost like the message has been stamped. This means that you won’t be able to see the signature in your inbox. To ensure you don’t run the risk of your Office 365 signature not working, check out this article on what you can and can’t do in an Office 365 email signature. For other common email signature mistakes, check out our 17 Email Signature DOs and DON’Ts. 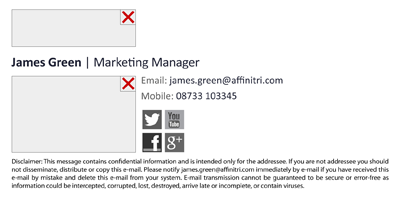 Wish that email signature management in Office 365 wasn’t so complicated? Do you want to make sure that you never have to deal with your Office 365 signature not working again? Using a third-party solution is the best way to easily solve all your email signature headaches. You’ll be able to embed imagery, get high-quality signatures on all devices, create separate reply signatures that appear correctly in an email conversation and so much more.